Professionally Designed Ocean Proven. Thousands of Boden designs have been built from the stock plans available. Many have completed world circum-navigations and long cruises. Boden has raditionally specialised in the design of safe seaworthy power and sailing craft for pleasure and commercial use built in steel, aluminium and timber. Custom designs in any material are also undertaken. 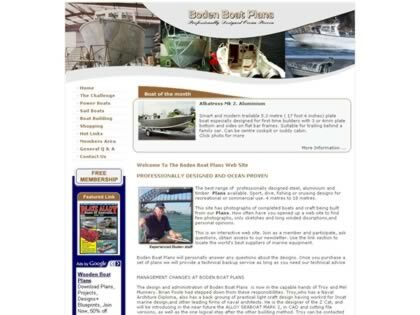 Web Site Snapshot: If available, above is a snapshot of the Boden Boat Plans web site at http://www.bodenboatplans.com/ as it appeared when this site was added to the directory or last verified. Please Note that Boat Design Net has no involvement with the above web site; all content and images depicted in the above thumbnail are the property and copyright of Boden Boat Plans unless otherwise noted on that site. Description: Professionally Designed Ocean Proven. Thousands of Boden designs have been built from the stock plans available. Many have completed world circum-navigations and long cruises. Boden has raditionally specialised in the design of safe seaworthy power and sailing craft for pleasure and commercial use built in steel, aluminium and timber. Custom designs in any material are also undertaken.